Enhance your projects with creative typography. Examples of good typography are all around you if you know where to look. Less is more. Keep the number of fonts on your page to a minimum. It's much better to use two or three different fonts effectively than it is to use seven or eight different fonts to make one confusing jumble of type. Leave enough "white space" on your page. Having some blank space on your page gives the viewer some breathing room. Resist the temptation to fill every inch of your page with text. Use contrast to distinguish between elements. Having one element in bold type or printed at a noticeably larger size is a simple way to communicate its importance on the page. Keep it consistent. Good typography showcases standardized design. In the pages of a scrapbook album showcasing pictures from your vacation, for example, it's useful for the viewer to know where to look on each layout to find the journaling and photo captions. 30 Inspiring Type Treatments: This article demonstrates some of the amazingly creative effects you can accomplish just by manipulating the text on your page. 40 Examples of Beautiful Typography in Advertising Design: Advertisements can be a great source of typographical inspiration, as the examples in this article illustrate. 75 Web Sites with the Best Typography: Although Web design does use different principles than print design, you can still find examples of good typography that can be adapted to fit your own projects. 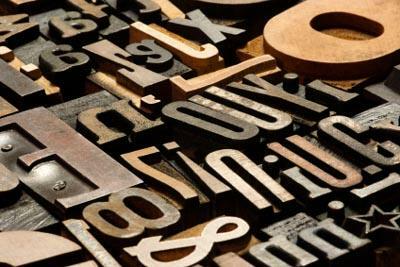 30 Best Fonts for Designers: This article showcases some of the best fonts around and gives suggestions for how to use them effectively. Color and Typography in Good Design: Since color can also be used to emphasize certain elements within a project, it's important to consider how this influences your typographical choices. Keeping a small notebook filled with examples of good typography is a great way to make sure a source of inspiration is handy whenever you begin work on a new project. Print your favorite examples from the Web sites listed above, collect newspaper or magazine clippings that showcase typographical techniques you want to try, and save interesting design elements from product packaging. To make your inspiration book more useful, try to organize the ideas by their style.